During 2013 the annual added liquid volume from tight plays in the US amounts to over 1.3 million bbl/d, with a light oil content of more than 70%. For 2014 the annual liquid production growth is expected to be at least 80%, with similar light oil content. * The main contributors to this growth are Bakken, Eagle Ford and Permian plays, which make up around 65% of the increase. One debated question is whether this growth can continue or if there will be a reduction in the additions [Source: NASCube]. The historical tight oil production growth has been driven by increased investments, more effective drilling and better well performance. From 2008 to 2012 the annual investment growth was around 40%, which resulted in a considerable year-over-year (YoY) growth in the number of new shale wells brought online every year. At the same time, drilling efficiencies have considerably increased by nearly 50% over the last 2-3 years. However, drilling only accounts for around one third of the well cost, meaning completion well costs (CWC) have only decreased by around 20%. In the different plays there has also been a substantial learning over the last years resulting in higher initial production. The average IP for wells in Bakken has increased from 670 boe/d in 2008 to 900 boe/d in 2013 [Source: NASCube]. Going forward, the tight oil spending growth is expected to slow down, and the potential for drilling efficiency gain and learning effects in the plays will diminish. At the same time, the production from already drilled wells will decline continuously, meaning more and more wells will be needed to maintain high production levels. Together, these effects will result in slower oil production growth over the next period, even though investments are slightly increasing [Source: NASReport]. 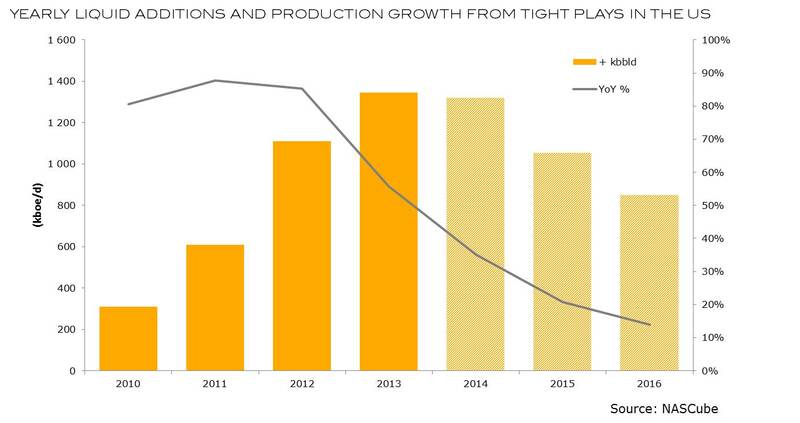 The continued high spending in US tight plays in 2014 will lead to increased tight oil production during this year, with EOG Resources leading the added volumes during both 2013 and 2014. EOG is the largest producer in the Eagle Ford play and it also produces tight oil from Bakken, Permian and Barnett. Although EOG will add more than 160 thousand bbl/d of light oil during 2013 and 2014 combined, the tendency of the yearly added volumes is to decrease during 2014. The same tendency is observed in other independent companies such as Chesapeake, Continental Resources and Marathon Oil. However, this is not the general case. The largest operators in plays, which are moving into accelerated developments such as Anadarko and Noble Energy in Niobrara will experience an increase in the added tight oil production during 2014 compared to 2013. Devon and Apache will also experience the same tendency, as these companies aggressively increase activity in their already producing tight oil assets [Source: NASReport]. * Annual added light oil production alone is expected to be 1 million bbl/d.